MidiALF main pcbs are here! First batch of MidiALF main boards is here! I’ll build one to make sure everything is OK and will be emailing you guys shortly. You can purchase MidiALF main board directly from me for US$35.00 and pre-programmed ATmega644p MCU for US$15.00. The CV extension board (when available) will be sold for US$30. The prices do not include shipping from California, USA. Currently I can only accept PayPal payments. The BOM cost at Digikey for the components needed to complete MidiALF main board comes to about $80 not including taxes and shipping cost. 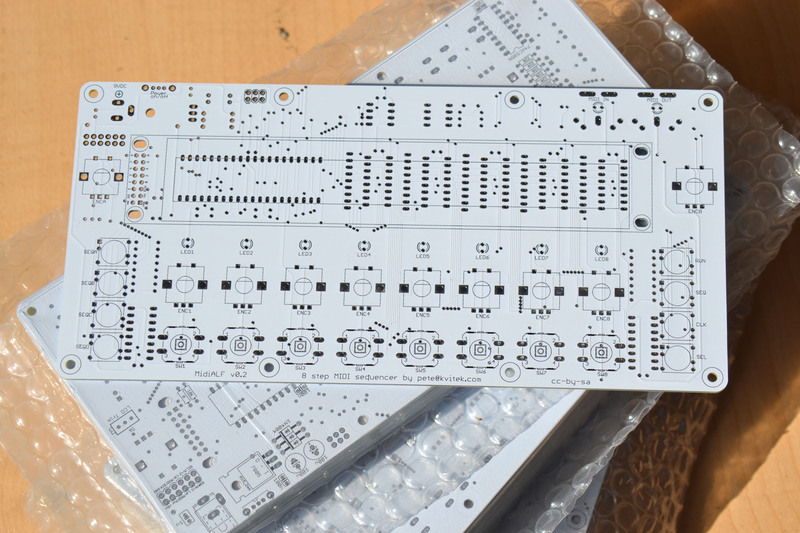 Just wanted to let you guys know that first batch of MidiALF main board PCBs has been sent to the fab, expected to be back here in a few weeks. CV board design is finalized, waiting for the main boards to arrive so I can make final tweaks.